March is the worst. Maybe not the coldest winter month, but the fussiest. Roads and parking lots turn to a brown ice-sludge. Hints of springtime reveal themselves to be mirages hiding the next deep freeze or a blizzard. The kids are bored, and you’re just sick of it. While we can’t end winter early for you (not yet, anyway), we can suggest this is your last chance to take on a fun Winter Photo Project. 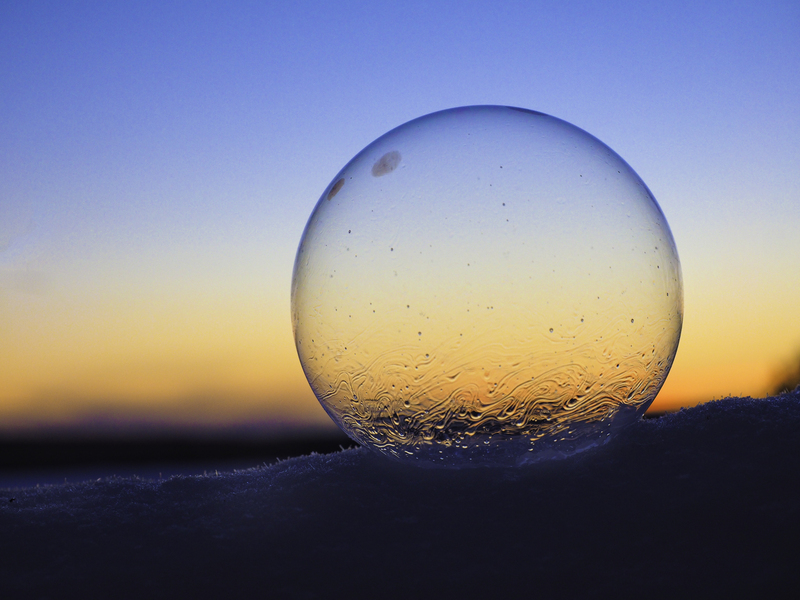 Aptly called Frozen Bubbles, we came across this photo project courtesy of Olympus Trailblazer, Peter Baumgarten, who wrote up it up over at his website, Creative Island Photography. I’ve gotten to know a few Olympus Trailblazers over the last two years and each one offers a uniquely passionate take on what photography means to him or her. Peter was kind enough to share his Frozen Bubbles recipe with us and then sit down for a quick interview, which you’ll find below. First up, the project. Frozen Bubbles are made from a combination of sugar, water, and cold temperatures for optimum crystalization (Peter recommends -20º C / -4º F). The corn syrup will provide the structure, while sugar helps form the crystals. It’s also a good idea to grab a couple different LED lights to either light the bubbles directly, or to supply ambient lighting (the top photo above). We’ll get to camera settings in a moment, but for gear you’re going to want a camera with weather sealing to shoot for long periods of time in sub-zero temps. The Olympus OM-D Series is one such example. Stir the ingredients together until all of the sugar dissolves, then place the mixture in a freezer or outside in the frigid air. Peter uses “a thin tube with a flared end” to blow the bubbles, but a drinking straw may also work. They will last anywhere from a few minutes to an hour. Peter placed his bubbles on the snowy railing of his home’s deck, which allowed him to set up a tripod comfortably as well as providing a more interesting background for composition. 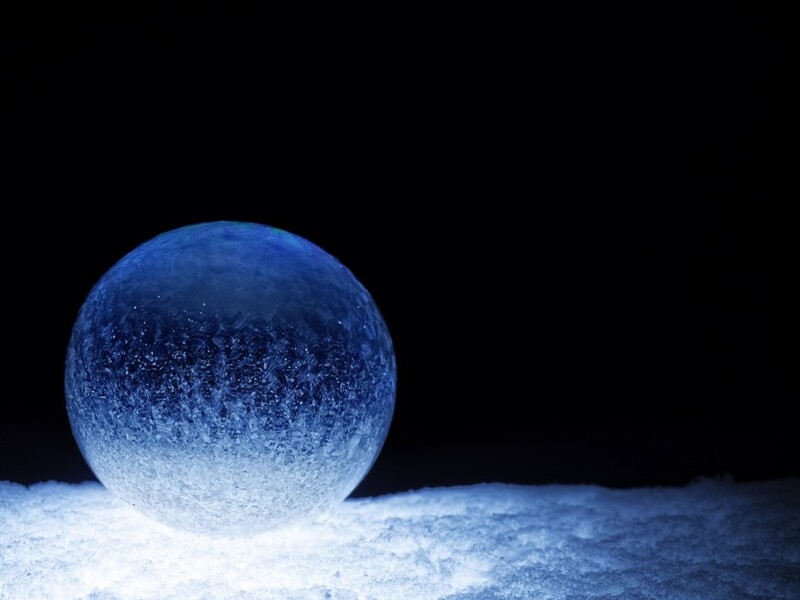 If you plan to use in-snow LED lighting, place the light before blowing your bubbles. Peter says they will last anywhere from a few minutes to an hour. The key, though, is to avoid anywhere windy to protect bubble integrity and allow for longer exposure times if you’re shooting in lower lighting conditions. The slightest breeze will move your bubbles (beware, beware!). In terms of composition, here’s the time to make the project your own. Consider everything. Are you going to shoot one bubble or more? What’s in the background, and how will it add to your composition? Where will the sun be when you’re shooting? Is background even important? Do you want a shallow depth of field, or more of a everything-clear Macro Photography look while focusing as closely as possible? Peter found excellent results using both natural sunlight (and post-sunset light) while also using the aforementioned LEDs to light his surroundings and even the bubbles themselves. Peter shot his Frozen Bubbles using the Olympus OM-D E-M1 flagship Micro Four Thirds camera system outfitted with the M.ZUIKO 12-40mm f/2.8 PRO. In my personal experience, the OM-D Series with the M.ZUIKO PRO series lenses are fantastic. Fast. Customizable. Rugged. Exactly what this photo project needs. The key is to keep shutter speed fast enough to account for any bubble movement. If you’re shooting after sunset and there’s no breeze, you can also set up extended exposure length. 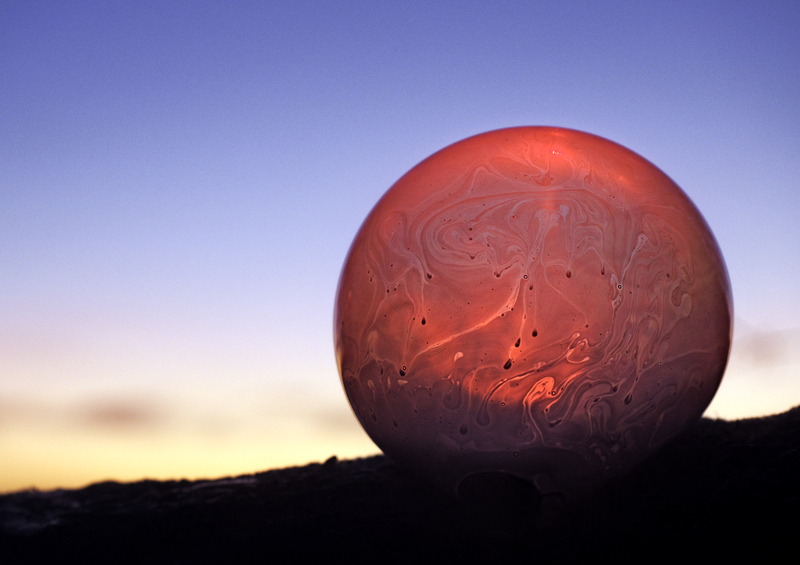 If you happen to be rocking an Olympus camera with Live Composite Mode, you might even want to experiment with light painting around your bubbles. Fun, right? Now it’s your turn to try making your own Frozen Bubbles. Please be sure to share your photo project results below or by reaching out on the Steve’s Facebook Page. Cheers. After falling in love with Peter’s Frozen Bubbles project, we sat down with him for a quick interview about his photography background and, of course, the project itself. 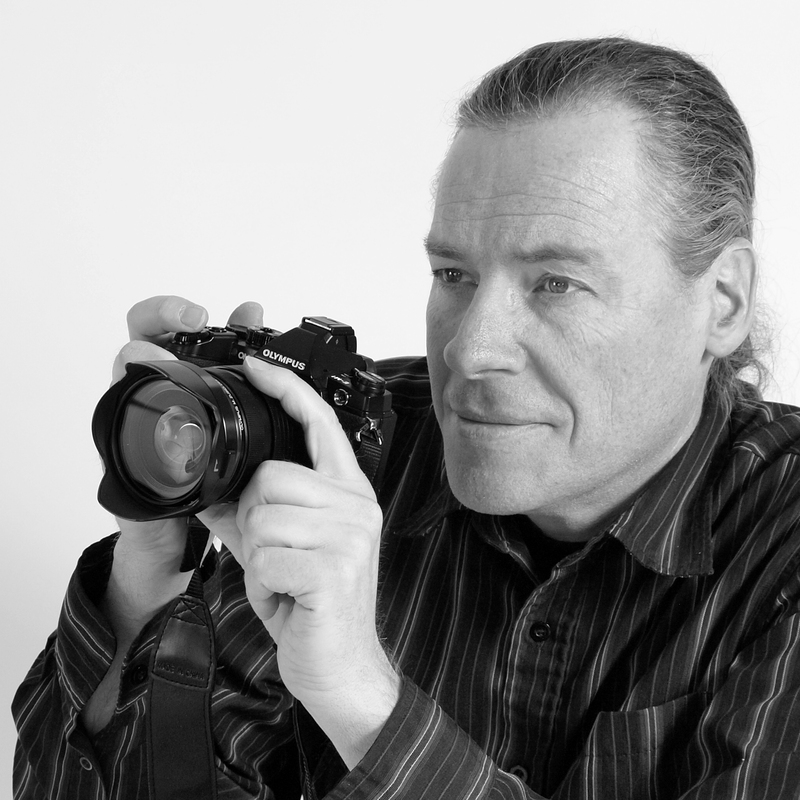 Steve’s Digicams: In your bio, you mention getting your first camera at 12 and reading Freeman Patterson’s “The Art of Seeing” as the foundation for your photograph career. How did you get the camera and come across Mr. Patterson’s book? Peter Baumgarten: At the age of 12, I got my first summer job flipping hamburgers and making French fries at a small fast food restaurant in the tourist town that I grew up in. Minimum wage was $2.00 per hour back then, but by the end of the summer I had saved just over a thousand dollars. My dad insisted that I buy something useful with my money. He was a bit of a photographer and he encouraged me to consider getting a camera. I invested in an Olympus OM-1n, a now classic film camera. Shortly after that I was looking through a local book store for photographic inspiration (and some basic know-how), when I came across Freeman Patterson’s book, “Photography and the Art of Seeing”. I bought it, read it cover to cover, and absorbed a lot of his basic ideas and applied them to my own work. What did you take away most from “The Art of Seeing” and how was your work evolved since then? IE, what parts of that book do you still hold dear, and what insights have you developed personally? The thing that impressed me the most about Freeman’s book was the fact that there was very little mention of the technical aspects behind photography. It wasn’t a book about understanding the science behind photography (ISO, white balance, etc.). It was a book about the art of photography and how to see the world differently. That really spoke to me. When I teach my photography courses and conduct workshops I still use that as the crux of my message – composition comes first. The course is half over before we start talking about the more technical aspects of photography. You have to see the image in your head first. More importantly, as a nature/landscape photographer you have to be able to think quickly and put the pieces of that scene together in a way that has the greatest visual appeal. What was your path to becoming a professional photographer, and what was your first gig? As a teenager, photography became a true passion. In the days of film, every image cost you money. As such, I would really focus on the overall composition before I pressed the shutter release. I honed some important skills in my youth, but never considered it a career option. Instead I decided to go into education and became a teacher – a choice I’ve thoroughly enjoyed over the past 30 years. It’s only in the last 5 or 6 years that my passion for the craft of photography has been reignited and become a second career. I do a bit of commercial work for local clients and sell my work online and in local galleries. I consider myself fortunate that I don’t need to earn a living from my photography. I have also discovered a real joy for blogging, especially articles that teach a particular technique. What was the hardest gig you’ve ever had that also taught you the most? Every photographer, regardless of skill-level or genre gets asked to do weddings. I’ve shot a few and always find those events to be the most stressful. The conditions are usually less than favorable and the bride and groom are counting on you to get it right. That’s when I dig deep and trust my own ability and skill level. The scariest incident I’ve had was when I was doing some astrophotography this past autumn. I set up my camera by a roadside lake in a local wilderness park to do some star trails. I decided to leave that camera to do its thing and drove off to another location for a couple of hours to do some more actor work. Upon my return I walked back along the trail in the dark and ended up face to face with a bear. Thankfully we were equally scared of each other. Next time I will use my headlamp and make a bit more noise. Perhaps the most important lesson I’ve learned from all of my photography gigs is patience and perseverance. Getting great images is hard work. As a teacher I know all about having patience with people, but photography brings it to a whole new level. I have waited for hours hoping that mother nature would cooperate, only to be foiled. That’s patience. Perseverance is going back the next day, the next month, or the next year to try and capture the one shot you can visualize in your head. What’s the ratio of images captured vs the ones you share / publish? When I first got into digital photography it was probably 100 to 1. Now, it’s more like 1000 to 1. I won’t share any of my images unless I am completely satisfied with them. How did you become an Olympus Trailblazer? Back in 2011, I came across the site, 500px. I started posting my best work and got a good reception. Olympus came across my images in 2013 and asked if they could post a few on their Facebook page. I agreed, but didn’t think much of it at the time. Then, in March of 2014 I received an e-mail request for a phone interview. I thought they wanted to know a bit about my work, or why I shoot with Olympus products. I had no idea that they were interested in having me as an ambassador for their company. There was absolutely no hesitation on my part, and it has become an incredible, life-changing experience. Frozen Bubbles. They’re stunning. If I didn’t live in Los Angeles, I’d be out making some right now. What inspired this project? My need to experiment! Photography is an art form that has few limits. I recall reading an article in a major trade publication where the author stated, “If you want to make it in photography, you need to specialize.” There may be some truth in that, but for me I need to push beyond what I know, and play with the art form. The frozen bubbles is another photography experiment among many. I’m sure it’s the science teacher in me. I’d love to tell you that it took weeks of non-stop experimenting to perfect the recipe, but that would be a lie. I found the recipe online and it worked. Each ingredient plays an important role. The dish detergent, of course, creates the bubble, the white corn syrup thickens it, and the sugar creates the interesting crystals that form. You can substitute glycerin for the corn syrup. What was the most challenging aspect of this photo project? Hands down, the incredible cold! We’re not talking chilly here, we’re talking face, feet, and hand-numbing cold. If you dress for it, however it is bearable. Beyond that, it is the wind. Even the slightest breeze will pop most of your bubbles. What happens if this experiment is tried in non-winter conditions? 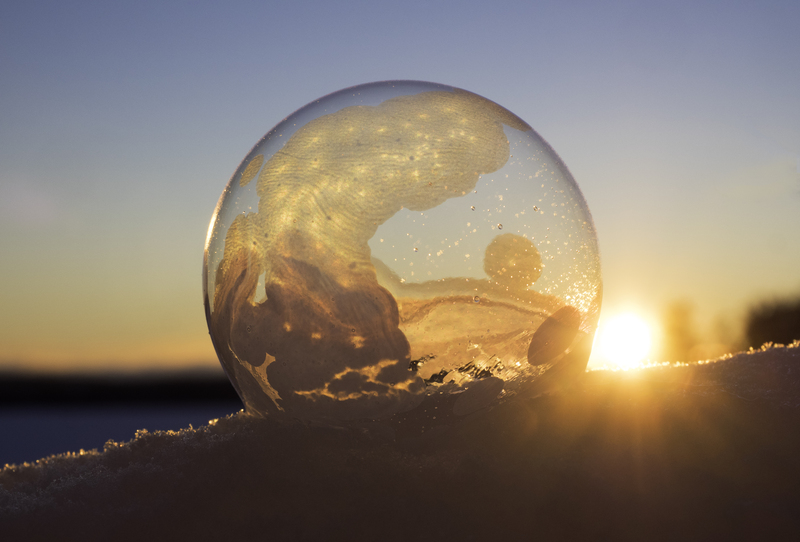 Honestly, you get ordinary soap bubbles, which can make interesting subjects on their own, but without the extreme cold, the bubbles won’t crystallize. What’s your favorite season to shoot? There are fantastic opportunities in each season, but I have to admit that photography has rekindled my love affair with winter. The same landscape can change quite dramatically from day to day, which keeps me coming back for more. Winter is a magical time, and let’s face it, most people don’t go out exploring during the winter months. A lot of my local followers live vicariously through my winter images. My family owns a rustic cabin on a small island in Killarney Provincial Park in northern Ontario. It is an absolutely wonderful place to spend time hiking, canoeing, swimming or just lounging around. It is heaven on Earth. And the photo ops are amazing! Like many art forms, photography can be mastered, but there’s always more to learn. What are you working on now, and do you want to try next? Over the past year I have been focusing on astrophotography. Like many photographers I used to put my camera away once the blue hour arrived. With today’s great image sensors and the incredibly fast, sharp lenses from Olympus I thought it was time to experiment with some night sky photography. It also helps that I live in dark sky region without any city lights to dampen the Milky Way. I have also been experimenting with some time-lapse images – two of my cameras are shooting a sequence right now as I type this. Many things in our life just move too slowly for us to notice. I like the challenge of trying to capture those things. When I am finished with that blog post I will let you know. 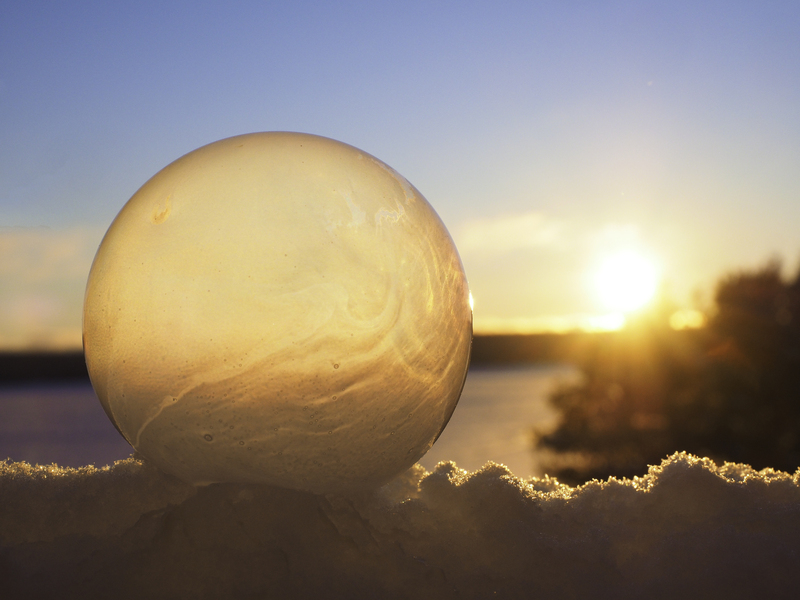 Thanks again to Peter for sharing his Frozen Bubbles photo project with us, and for taking the time to answer a few questions. For more information — and other outstanding blog posts — visit Peter at Creative Island Photography.